Would I change the "Police_Radio_HUD_Text_Off" string? Wouldn't that just change the the text and not the actual keypress? I suppose I'll have a look at implementing it later today, seeing as it's been one of the most requested features. It will probably function identically to surrender's shout key, so server owners won't enforce it on a key people keep binds on. EDIT: Also, sorry about the late response! I forgot to view the forum while logged in, so I didn't receive any e-mails about people posting here. Took a little longer than expected, thanks to me forgetting... Oh well. Fixed an issue where the F1 help menu entries didn't turn green, because I forgot to change the variable to the new format. Replaced a few ! with . in the chat messages for the /giveradio and /removeradio commands. Changed SetPData("Police_Radio_Allow",false) to RemovePData("Police_Radio_Allow") to clear the data entirely. SendLua has been changed to networked messaging instead. Replaced a few LocalPlayer function calls with a cached variable instead. Removed the "automatic download" functionality, as it didn't even seem to work. You need to add the textures to download manually. The HUD_Vehicle_Text_Off variable is no longer used, as it's no longer neccesary now that the key can be changed to something that doesn't interfere with vehicle functionality. The way the addon is to be installed has also changed. It's to be installed in the addons folder now, instead of darkrpmodification. God damnit.... I forgot to change the name of the hook when copying the code over from the surrender code. If you've recently downloaded the update, redownload it again, or you may experience issues with surrender's shout key when run along this. Yo this error pops up in console sometimes even though i dont touch the file, sometimes theres no error sometimes there is? Simple module that allows permitted jobs to commune with each other through voice chat, at any distance. All jobs that has been added to the table inside the config file of the module (or jobs part of GAMEMODE.CivilProtection) will see a new thing on their HUD and hear every single cop who currently has their radio on! Hi, just wondering why I get spammed with this and how to fix it. This happens when I spawn into the server, but does stop when I change jobs. Upload your cl_p_radio.lua and paste it here. I haven't made any changes to that file, or at least yet but I basically had this issue after downloading this which was an updated version from my other one. That won't help. It's because the job table isn't available to the player by the time they're loading. I need to add a check to see if the job table is valid in the Think hook, just as I have in the HUDPaint hook. 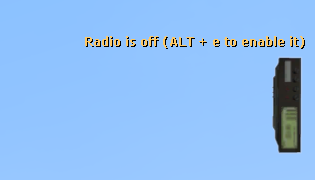 Hi, I was wondering if anybody knows a way that someone can edit the radio to make it so players can turn their radio off as in they won't hear people speaking for a short amount of time because being staff on a server and having to stay in the police job gets annoying when nobody wants to listen when radio silence is called. I would appreciate if I could get feedback because I would be willing to pay for the modification that allows a toggle of sound for the radio. Possible fix for errors appearing when joining the game. Added "HUD_Text_On_Receive" and "HUD_Text_Off_Receive" as text shown above the normal text. Removed the "Only_If_On" variable and replaced it with "CanHear_Default", which decides whether or not the receive state is set to on or off by default. I'm leaving the old version for download here in the event that someone prefers the old method of toggling hearing, I'm not updating it though. If we paid extra could you add the feature to the new update so it's a private file for our server? Hey, i was using this for a long time. Thanks again for this great addon!